Shine on you, Marine! 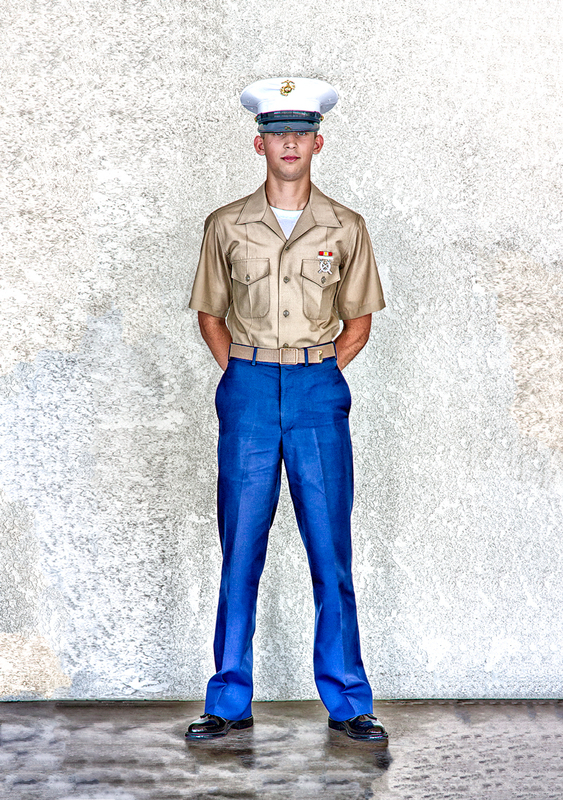 This young man just graduated from boot camp. His father asked if I can take a picture of him. I don't usually shoot formal portraits -- in fact, I think I've only done a handful. So rather than shoot traditional style, I thought I would give it my own -- well, twist. This was taken at the side of the church building. All natural light. While shooting, I learned that there were certain military etiquettes that needed to be observed. For instance, the Marine in uniform cannot make eye contact with the camera. (Hence, the faraway eyes.) The Marine cannot smile while being photographed. (I think he was trying not to smile but his slight grin betrays him.) There were other things that the marine cannot do, which I don't remember. I also can't remember how I post-processed the photo but I'm pretty happy with the result. It reminded me of a tamer David LaChapelle glamour shots. Maybe Rolling Stone Magazine will buy it. Hi Rob . We have a similar set of etiquettes here in Oz since 911 for our passport photos .